When high-rises in Mexico City swayed for more than a minute on Saturday night, people feared for their lives. Many inhabitants of the Mexican capital remembered the nightmarish scenario 26 years ago, when similar movements led to one of the worst natural disasters our neighbors to the south ever suffered. On 19 September 1985 an earthquake, with a focus more than 200 miles away, wreaked havoc on many buildings in the capital city (see blog 19 September 2008). But the swaying on Saturday subsided without causing any significant damage. The seismic gap near the resort town of Acapulco is clear on the map showing the major earthquakes which occurred along Mexico's west coast in the last century. A seismic gap is a tectonic time bomb waiting to go off. (from Ramirez-Herrera et al., Geofisica Internacional, 48, 195, 2009). Nevertheless, the latest 6.5 earthquake was a reminder that Mexico City is vulnerable to seismic waves approaching from country's distant Pacific coast. The earthquakes there are caused by the subduction of the Cocos Plate, one of the dozen or so tectonic plates which make up the outer layer of the Earth, under the North American Plate. The Cocos Plate approaches from the southwest with a speed of just over 2 inches a year. Upon colliding with the North American Plate, it bends downward and begins to sink into the Earth's hot mantle. The mechanical stresses associated with the bending and the temperature change cause the subducting Cocos Plate to break, hence the temblors. The Cocos Plate diverges from the Pacific Plate along the East Pacific Rise. Its subduction dominates the tectonic regime along most of the western coast of Central America, from Panama all the way to the Mexican resort town of Puerto Vallarta. In the past century alone, dozens of earthquakes occurred along this subduction zone, among them the 8.1 temblor which cost thousands of lives and produced severe damage in Mexico City. 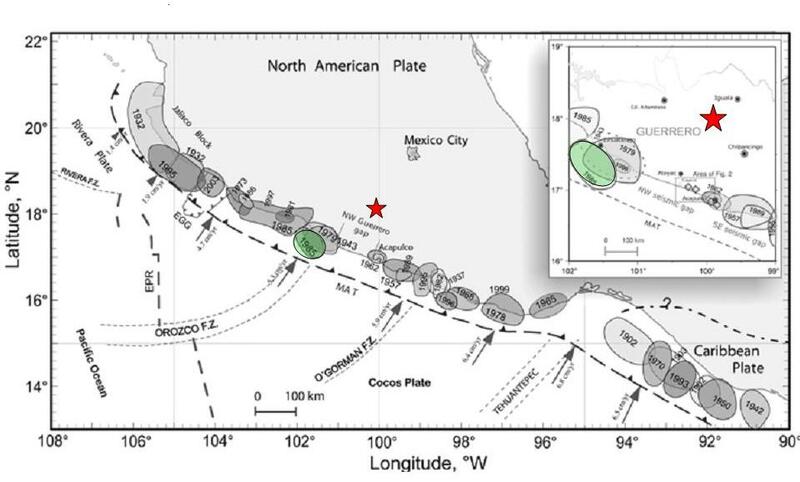 The locations of each of the strong quakes which occurred along Mexico's Pacific coastline are shown as grey areas on the map, with the extremely destructive 1985 quake marked in green. The area just to the southeast of the green region is conspicuously empty. For more than 150 years, no significant quake with a magnitude greater than 7 has occurred in the immediate vicinity of the tourist town of Acapulco in the Mexican state of Guerrero. The absence of large earthquakes in one region along a tectonic front is called a seismic gap. Such gaps are tectonic time bombs waiting to go off in a major earthquake. At most other locations along the Cocos subduction zone the tectonic stresses have been release by earthquakes over the last century. However, during that time, nothing happened in the Guerrero gap. There the stresses caused by subduction have built up. As a result, seismologists expect a really big earthquake in this region. It would not only flatten Acapulco but, like the 1985 temblor, would cause significant damage in Mexico City.